Thailand's "Red Shirt" anti-government protest movement reacted cautiously Tuesday to the prime minister's proposal to hold elections in mid-November as a way out of a crippling political crisis. Thai Red Shirt anti-government protest leader Natthawut Saikua (3R), flanked by other protest leaders, makes an announcement on the latest proposal by the Thai prime minister in downtown Bangkok on May 4, 2010. But leaders of the mostly poor or working-class Reds, who have been rallying in Bangkok since mid-March, did not reject Prime Minister Abhisit Vejjajiva's offer outright, offering a ray of hope for an end to the tense standoff. "Our stance on Abhisit's reconciliation roadmap will be made based on the interests of the people," Jaran Ditha-apichai, a senior Red Shirt, said from a rally stage in the city's commercial heart. "For the sake of the struggle for democracy, we will discuss and listen to our people who are on the frontline." The movement said that it wanted to be sure the proposed roadmap had the full backing of ruling party lawmakers and their coalition partners in the government before giving a response. "We will discuss among more than 20 leaders whether or not to accept it, but initially I agree with one of the proposals -- to end the deadlock in a non-violent way," said another Red Shirt leader, Nattawut Saikuar. A series of bloody clashes between the demonstrators and security forces in Bangkok have left 27 people dead and nearly 1,000 people injured in the country's worst civil unrest in almost two decades. Many of the Red Shirts -- who want immediate elections -- seek the return of former prime minister Thaksin Shinawatra, who was ousted in a 2006 coup and lives overseas to avoid a jail term for corruption. Speaking on national television, Abhisit said Monday his proposal to hold elections in November -- a year earlier than scheduled -- was subject to all parties agreeing to his reconciliation roadmap. The plan calls for respect for the monarchy, greater social equality, an impartial media, an independent probe into the recent political violence and a debate on the need for constitutional reform. "I'm convinced that it will not take long to achieve national reconciliation and when we achieve national reconciliation, the government is ready to hold elections on November 14," said Abhisit. "I think this is the best solution at the current time," he said. Abhisit, the British-born, Oxford-educated head of the establishment Democrat Party, does not have to go to the polls until the end of next year. 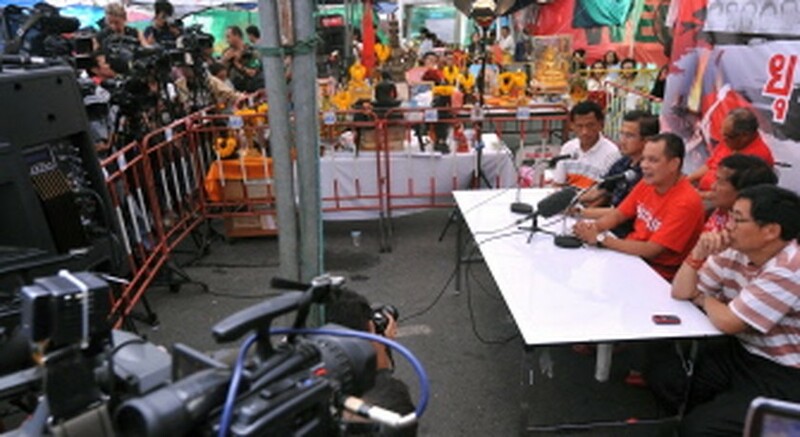 Some observers say that when he does face the people, his failure to connect with the rural masses means he faces a tough battle against the pro-Thaksin forces that have won every election for a decade. Abhisit's party came to power via a parliamentary vote in 2008 and for Pavin Chachavalpongpun, a Thailand expert at the Institute of Southeast Asian Studies in Singapore, it will be "very difficult" for him to win an election. "Because he represents the Bangkok elite, it's hard to win the hearts and minds of the people in the north and northeast," the analyst said. "Meanwhile Thaksin remains hugely popular in those regions." Abhisit last month rejected a compromise offer by the Reds to disperse if elections were held within three months, and the protesters reverted to their demand for immediate polls. In March he had offered to hold elections by the end of the year but protest leaders rejected that proposal. The Red Shirts have fortified their sprawling protest site in the city's main shopping district with barricades made from piled-up truck tyres, razor wire and bamboo stakes. Their campaign has caused several hotels and major stores to close for now, and prompted foreign governments to warn against travel to the "Land of Smiles", dealing a heavy blow to tourism in Thailand.